I blog about design multiple times a week at GraphicDesignBlender.com. That means I also have the opportunity to meet a lot of graphic and web designers who are working to establish their own design blogs. Sadly, more often than not, I talk to designers who are frustrated with blogging about design. Today, I’d like to explain why your design blog is failing and the success secrets that the big design blogs don’t want you to know. I’ve worked with a lot of designers to try to help them get their design blog off the ground. And the most common problem I see is that they’re working really hard on all the wrong things. 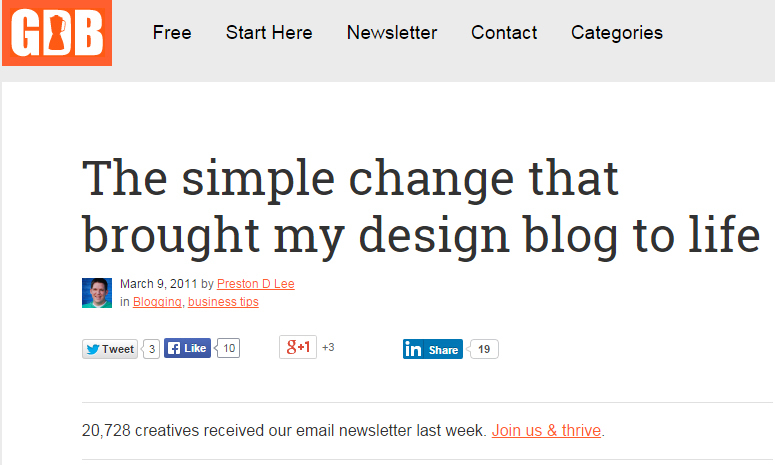 The truth is most design blogs fail within the first 6 months. The biggest reason your design blog is failing is because you’re not concentrating your efforts in the areas where it counts the most. So where does hard work get you the best results? That’s exactly what the big blogs don’t want you to know, but today, I’m going to spill the beans and let you in a few secrets that will turn your blog from rags to riches. Perhaps one of the most common and well-known tips shared in the blogging niche, this tips is usually a well-kept secret in the design-blog world. If you want readers to keep coming back to your blog, you must solve problems for them. Sure posts full of inspirational logo designs are great every once and a while. But designers can only enjoy inspirational posts so long before they hunger for tutorials, how-to posts, and problem-solving articles. People are also more likely to share a post they find helpful. You’ll get a lot more traction with an article like “10 tips to help you design the perfect logo” than you will with “50 logo designs for your inspiration”. Take Smashing Magazine for example. They solve problems for their audience every day. That’s what keeps readers coming back for more – and that’s exactly what Smashing Mag doesn’t want you to know. A lot of design-bloggers complain that no matter how much they blog, they don’t seem to bring in any new clients from their blog. When I look at what they are blogging about, they have posts related to “How to manage design projects” or “How to design a logo”. If the primary purpose of your blog is to attract design clients, these are the wrong topics for you. Define your target audience. When it comes to blogging about design, you can usually either choose potential clients or designers. You have to know who you’re writing to in order to achieve success with your design blog. Take Chris Spooner for example. He offers killer design tutorials on his blogs. But he knows that he’s less likely to find design clients through his blog. He blogs for designers and that’s where he makes his money (through premium memberships, ads, and more). A lot of design-bloggers think you can just post something and watch the advertising money roll in, the RSS subscribers skyrocket, and the fame tag along. If you don’t stay active on your blog it will fail. If you blog about tutorials, be ready to answer questions about the technique. If you blog about the business of design, be ready to help solve business problems for your readers and commenters. You can’t just post content and then get back to designing. Take time to engage with your readers and you will see your blog grow faster than ever. Of course, that can prove very difficult when you’re working as a designer full-time. But there’s hope. You can successfully run a design blog without sinking your design business. Lastly, you need to learn how you define success as a blogger. Are you successful when you reach a certain number of subscribers? Are you successful when you get a high number of pageviews? How about when you have advertisers or when you’re well known in the online design community. Many designers who blog think they are failing only because they haven’t defined success for themselves so it’s hard to measure and recognize your progress. How do you build your design blog? Do you blog about design? If so, how do you define success? Who’s your target audience, and how’s it going. I’d love to hear from you, so leave a comment.